Hope you are having a wonderful weekend! 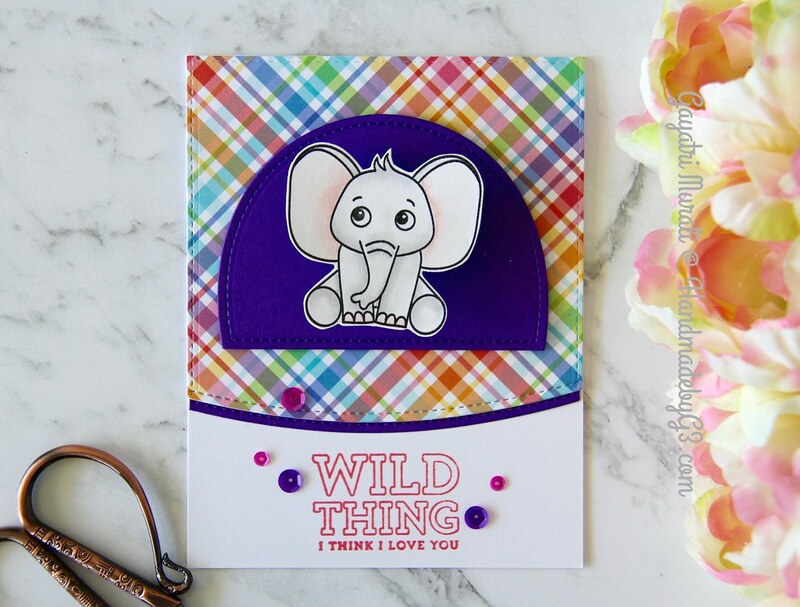 I have a second card to share using Simon Says Stamp Wild and Colourful card kit. This card is true to the name of the card kit – Colourful! Love the Lawn Fawn rainbow pattern paper in the kit. So colourful and so me! I mean I love bright and colourful things 🙂 I die cut stitched rectangles on both the rainbow pattern paper and the deep purple cardstock in the kit. I used the stitched curved die from Pretty Pink Posh to die cut the curved edge. I also die cut the same using the Deep Purple cardstock in the kit. I layered and glued them with a thin strip of deep purple peeking out. I adhered this on the white card base. I stamped the sentiment using the pink hybrid ink also in the kit below on the card front. For the focal point, I die cut a stitched half circle using the same deep purple cardstock. The die I used is again from Pretty Pink Posh called Window Frames dies. I adhered this on top of the rainbow panel. 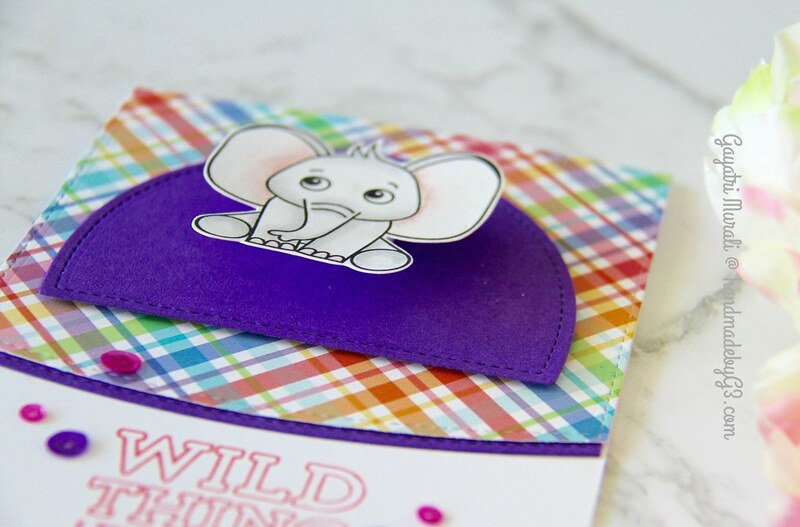 On the centre of this half circle die cut, I adhered the watercoloured elephant from the stamp set in the kit. And I used the mini wobbler from the kit to adhere the elephant. So cute when the elephant wobbles. You can see the dimension below. Finally I used matching Orchid and Amethyst sequins from Pretty Pink Posh to embellish the card front. 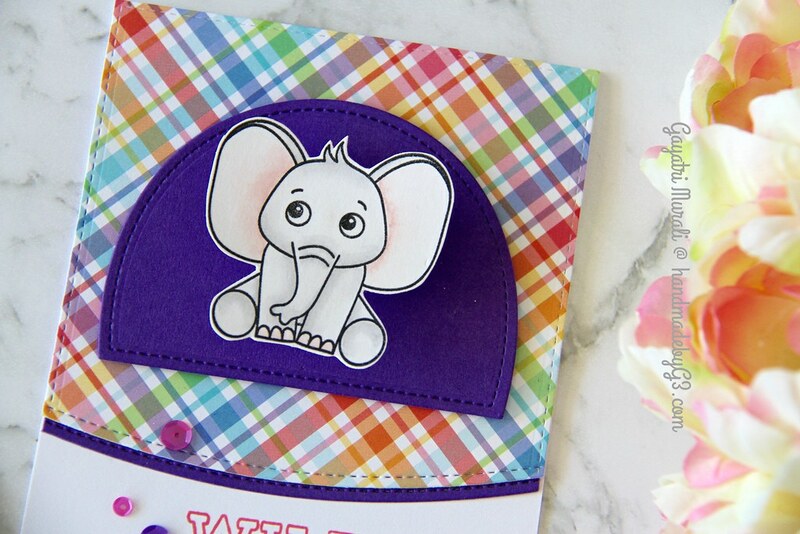 I love how cute, fun and colourful this card turned out. The sentiment is also adorable. Although the card kit is sold out. All the items in the card kit are available for sale individually at Simon Says Stamp Store. All the supplies to make this card is listed below.